For the past several years, Carrie has been hard at work on her second book, this time acting as a co-author alongside reknowned neurosurgeon Dr. Joseph Maroon. At the age of 75, Dr. Maroon is still a practicing surgeon, has completed seven Ironman triathlons, recently climbed Africa's Mt. Kilimanjaro, and acts as the team neurosurgeon for the Pittsburgh Steelers. Delightfully too busy to write a book on his own, he asked Carrie to help him compile a compelling memoir that also acts as an inspirational resource for anyone looking to find more balance in their lives. While the book is a departure from her more academic writing, Dr. Maroon happens to be a mythology buff as well, and the two of them worked in numerous references to the classics—referencing the Greek goddess Harmonia, the story of Icarus' struggle for balance, and the concepts of mythos and logos that was so important to the Greeks. The book, titled Square One: A Simple Guide to a Balanced Life, will be released January 1, 2017. Carrie was happy to help four sixth graders from Baden Academy prepare for the National Mythology Exam and was as anxious as they were awaiting the results! But all of the students' hard work paid off—all four students earned medals: two gold, one silver, and one bronze, which means they all scored over 90% on the 50-question test. Carrie is proud of these students for taking on this challenge looks forward to opening up the testing to even more students next winter. After acting as a reader for the national exam, Carrie was asked to join the committee five years ago. She has enjoyed her travels to Wichita, Kansas, each summer to review questions from previous exams and to help prepare the test for the upcming year. For more information on the National Mythology Exam, please visit the American Classical League's website. Carrie's head was spinning after touring Greece with other educators from Pittsburgh's Classrooms Without Borders. After flying into Athens, the group began a clockwise trip around the mainland, visiting cities like Ioannina, Thessalonkiki, and Larisa, before returning to Athens ten days later. The sites were astounding—the Parthenon, the ruins at Delphi, the acres of olive trees, and the views in Meteora—and Carrie was overwhelmed by so meaningful moments: seeing Mt. Olympus, standing on the starting line in Olympia's stadium, and looking up at original artwork she'd only seen in books. A wonderful experience that she is now excited to share with her students back in the classroom! Carrie is heading to Greece! Carrie is thrilled to announce she is heading to Greece! Classrooms Without Borders, an organization founded in association with the Jewish Federation of Pittsburgh, is sponsoring the trip this upcoming June, and Carrie was asked to join them as the official mythology expert! Fifteen college, high school, and middle school educators from Pittsburgh—along with six local high school students—will be traveling together for 12 days, beginning their trip in Athens, and moving on to Olympia and several of the Greek islands. At the start of the 2013 school year, Carrie began working as an artist-in-residence at Baden Academy Charter School just outside of Pittsburgh. As an arts-integrated school, Baden wanted a program that showed the interdisciplinary facets of art. So Carrie developed a program called Calliope, named in honor of one of the Greek Muses, that incorporates literature and fine art. The program includes fairy tales, poetry, and fables in the younger grades and then introduces classical mythology to fourth graders. With Baden adding a fifth grade to its offerings this year, Calliope has expanded and now covers more mythology for these students, including the more complex hero myths and Homer's Odyssey. Students continue to devour the stories and can use the material as a springboard for other studies. • Lessons on how the hero Perseus slayed the snake-haired Medusa led to an understanding of why the term medusae was chosen to classify certain jellyfish. And that led to a wonderful project where the students designed jellyfish, carved them into styrofoam, and then inked the styrofoam to make multiple prints. • Lessons on the mythical architect and inventor Daedalus led to a study of Frank Lloyd Wright and an introduction to perspective drawings. And in the spring, students will be walking and studying a ground labyrinth on a piece of property adjacent to the school. Next up is a launch into the Odyssey! Carrie remains active on the American Classical League's National Mythology Exam Committee (NME), and she recently made her third trip to Wichita, Kansas to work with her fellow members. The NME now has seven exams, which are rotated so no student will repeat any one exam. The committee studies the scores and data from that year's exam, and goes question by question through the upcoming year's exam. Sometimes minor changes are made, while other times, the committee proposes entirely new questions or chooses to focus on a new book from the epics covered in the exam. Thanks go out to Diana Nixon and Allison Fiegel for hosting the committee's meetings at the beautiful Wichita Collegieate School. And for bringing such good snacks! Since September, Carrie has been serving as an artist-in-residence at the Baden Academy Charter School just outside of Pittsburgh. The class that she developed, which she named Calliope to honor one of the Nine Muses from classical mythology, is a combination of both literary arts and visual arts. The curriculum for first and second graders, for example, has included art projects based on a study of fairy tales and fables from around the world. The third grade year was based on the framework of Howard Gardner's multiple intelligence theory and allowed students to explore language and art through all modes of learning. And fourth graders spent the entire year studying classical mythology and arts inspired by the Greeks, using Carrie's Panorama as their guide. The Calliope program will grow with Baden Academy as it adds a fifth grade next year, allowing that class to continue with a more in-depth look at mythology, including a study of classical heroes as well as Homer's Odyssey. Take a minute to look through the blog Carrie has kept during this first year of the Calliope program. North Allegheny Social Studies teacher Jesse Warner has invited Carrie to speak to all seventh graders at Carson Middle School on the afternoon of March 21. 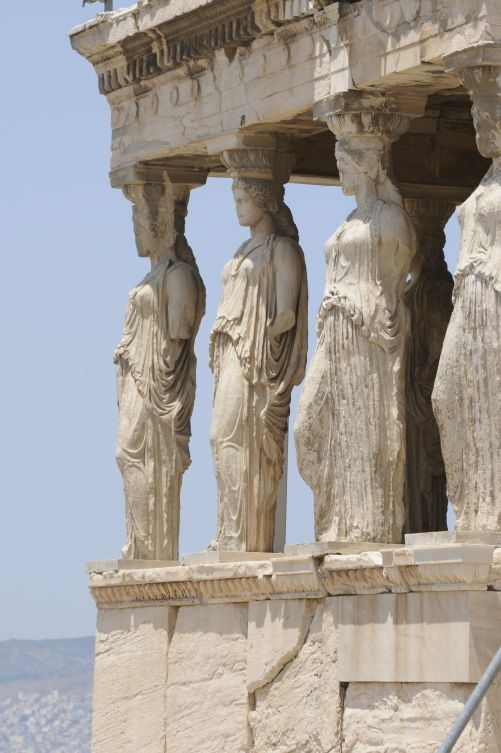 As the students kick off their study of ancient Greece, Carrie will be introducing them to the classical pantheon, helping them draw connections between the deities and the modern world, and retelling several myths. Carrie is thrilled to have her own daughter Grace in the audience! Carrie has served as an artist-in-residence this year at the Baden Academy Charter Elementary School, teaching the students through a combination of literary arts and visual arts. The class, which Carrie named "Calliope" after one of the Greek muses, helps build students' reading and listening comprehension skills, while also allowing them to explore the arts and art history. Carrie's curriculum has been so successful during this trial year that Carrie was recently asked to help develop a school-wide arts curriculum to help define Baden Academy's committment to arts integration and to encourage cultural literacy throughout the school's community. If you visit Baden Academy's website, you can see the fun work Carrie has been doing with her students on the Calliope blog. Over the last four years, Carrie has taught 10 courses for the University of Pittsburgh's Osher on-going education program for adults. This February, she will teach her final course, which she has titled "Connecting the Dots." The 5-week offering will tie together Carrie's previous courses on mythology, literature, art history, cultural literacy, and the theory of multiple intelligence, and she will offer hands-on experiences that target the importance of synthesizing information to keep the brain active and healthy. Carrie's experience with Osher has been wonderful, and she will be sorry to leave. But a fuller teaching schedule next year combined with her latest book project will mean she won't be available to instruct the Osher courses during the week. "Carrie is excellent and has the touch of a natural-born teacher." "I've taken other courses with Carrie Kenendy, and she is just great. She knows the subjects extremely well but so clearly enjoys teaching that it's just exciting to be in her class." "I wish the teaching world had more professionals like Carrie. As a lifelong educator and administrator, I have spent many years around teachers. What makes Carrie so special is her upbeat personality and her love for teaching. She doesn't take herself too seriously, she laughs right along with her students, and she is attentive to those who wish to contribute their ideas. She makes learning fun." Clew Publishing has an ad in the September-October issue of Home Education Magazine, a publication created in 1984 and filled with creative, supportive information for families. If you're a reader of the publication, we're so glad you found us! Please take a minute to look around our site, and feel free to email or call us with questions. And if you'd like to place an order, please use the code word mentioned on the ad to receive your special discount! Charles Shields, respected author of over 20 books for adults and young adults, read Panorama and commented that “the work is beautifully written and organized. An excellent treatment of an excellent subject.” Shields' biography on Harper Lee (2006) became a New York Times bestseller, and his version of the Lee's biography for young adults later received an award by the American Library Association. Shields' most recent work, a biography on Kurt Vonnegut (2011), was named a notable book by both the New York Times and the Washington Post. What an honor to have such a respected author praise Panorama! On Friday, August 9, the Penguins Bookshop in Sewickley will host a mythology day for children and teens. In addition to the games, food, and craft activities throughout the store, Carrie Kennedy will be the featured speaker. At the top of every hour, she'll present mini-lessons on mythology and read aloud from her book. And if you'd like to get a copy of Panorama as a resource for the upcoming school year, she'd be happy to sign it! Penguins is located along the main shopping area on Beaver Street, and the event runs from 11:00 to 3:00. Carrie has been asked to join the faculty of the Baden Academy Charter School just outside of Pittsburgh. Acting as one of the school's professional artists-in-residence, Carrie will spend time each week with students in first through fourth grades, integrating the visual arts with the literary arts. Carrie will meet with the children in the school's beautiful art room where she will help them explore topics such as classic literature, fairy tales, and mythology. Kudos to Baden Academy on its first successful year! Carrie is thrilled to be part of such an innovative educational program that focuses on creativity and the arts. Last spring, Carrie conducted a workshop on mythology and cultural literacy at the Children's Literature Conference through the University of Pittsburgh. This year, at the invitation of Conference coordinator Anna Mary Williford, Carrie will appear again, this time presenting on "The Story of Stories: Mythology and the Hero's Journey." The Conference, featuring both Caldecott Honor-winning illustrator Brian Pinkney and popular YA author Siobhan Vivian, will be held on May 3 at the Pitt-Greensburg campus. Almost 60 students have signed up for Carrie Kennedy's five-week OSHER class "Timeless Stories: Finding Connections to Mythology in Modern Literature." OSHER is an on-going education program for adults offered through the University of Pittsburgh, and Carrie is proud that she has gathered quite a following since starting as an instructor several years ago. On a course evaluation form, one attendee wrote, "I always highly recommend any class Mrs. Kennedy teaches. As a retired teacher myself, I would give her an A+. She is lively and informed and makes class sparkle!" Carrie will be signing copies of her book at "Women Read, Women Write," a fabulous event this Saturday, October 27, at Pittsburgh's Galleria in Mt. Lebanon. Over 30 other women authors wil be present, and the amazing Penguins Bookshop will be running the sales. Please click here for more information, and stop out between 1:00 and 6:00. Tune in to Pittsburgh's WRCT (88.3 FM) bright and early on Saturday morning, October 20. At 8:20, Carrie is scheduled for a live interview with the Saturday Light Brigade program, a family-oriented blend of music, games, and discussions intended to entertain and educate. Carrie will be talking about Panorama, the process of self-publishing, and her current teaching and writing projects. Don't get Pittsburgh radio? Try 91.1 in Grove City, 91.7 in Washington and Clarion, and 90.7 in New Concord, Ohio. The interview will also be archived on Saturday Light Brigade's website. Carrie Kennedy is honored to be the leader of the first parent workshop at the brand new Baden Academy Charter School. On Saturday, October 13, Carrie will be presenting a talk on Harvard Professor Howard Gardner's concept of mutliple intelligences and incorporating further ideas from Dan Pink (author of A Whole New Mind, and Drive) and Sir Ken Robinson (author of The Element). Carrie will be serving her second year as an adjunct in the Literary Arts Department of the Lincoln Park Performing Arts Charter School, conducting classes in mythology and writing. She was also asked back to teach another course through the University of Pittsburgh's Osher Program for on-going education, and so she is presenting a 10-week course called "The Story of Stories." Finally, Carrie will be working as a literary artist for the brand new Baden Charter Elementary School that opened in September. She will run a workshop on multiple intelligence for parents, consult with teachers and do arts infusion programs in their classrooms, and then begin two rotations of literary arts classes beginning in January. Carrie Kennedy traveled to Wichita, Kansas, in early August to meet with other members of the American Classical League's National Mythology Exam (NME) Committee. Hunkered down together at the beautiful Wichita Collegiate School, the members spent hours combing through exam questions, and Carrie and former chair Diana Nixon began work to redraft the Iliad questions for the upcoming 2013 exam. Over 10,000 students take the NME each year and receive medals based on the scores. Creating and reviewing the exams is a tedious process, but Carrie was delighted to work so closely other teachers who share her passion for the subject. Carrie had a great experience at the Children's Literature Conference at the Pitt-Greensburg campus on Friday, May 4. Librarians, educators, writers, and curriculum coordinators from southwestern Pennsylvania met up to network and to hear great breakout sessions. 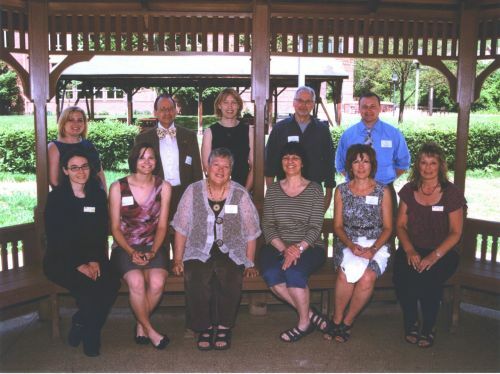 Keynote speakers were Caldecott Award-winning illustrator Eric Rohmann (standing on the other side of the pillar from Carrie in the back row) and his wife, renowned children's author Candace Fleming (seated second from right in the front row). The highlight of the day was hearing the details of the husband and wife's first collaborative project. We saw everything from Candy's handwritten first drafts, to her editor's notes, to the elaborate process Eric worked through to create his reduction prints. Then we became the first audience to see the finished page designs of a children's book called Oh, No! set for release this fall. Carrie Kennedy has been invited to speak to three blocks of students as part of Hampton High School's Lunch and Learn program on April 16. In the first part of her presentation, she will focus on the etymology of common words that derive directly from mythological names: the word "cereal," for example, comes from Ceres, the Roman goddess of the grain, and the colored part of the eye comes from Iris, the goddess of color and rainbows. The second part of her discussion will cover literature and film with mythological origins. Students may be surprised to learn that Suzanne Collins, author of The Hunger Games trilogy, was partly inspired by her love of mythology. She had always loved the figure of Theseus, who volunteered to go into the Labyrinth to try and slay the Minotaur, and the myth helped her develop Katniss Everdeen's character. Carrie looks forward to her school appearances and is pleased whenever she finds mythology-lovers in the crowd. Two Pittsburgh-area high schools—Moon and Quaker Valley—have put together an innovative career symposium for their students. Because of Carrie's experience as a technical writer, freelance journalist, and author, she was asked to serve on a "Communications and Journalism" panel for their Arts, Communication, and Humanities Symposium. The event will be held on Friday, April 20, at Moon High School, and the Keynote Address will be given by WTAE news anchor Andrew Stockey. After Carrie sits on the panel during three breakout sessions, she will be able to talk to individual students during an Open Forum. In early March, Carrie had the chance to meet up with a group of middle school students who have used Panorama in their classroom this year. The students attend the University Liggett School in Michigan, but Carrie never left her kitchen. Through the wonders of Skype, Carrie was able to conduct a 45-minute long author visit, meeting each of the students and seeing their mythology posters hanging on the wall behind them. One eager boy even tried to get Carrie to spill some information about the questions she helps to write for the National Mythology Exam! Enrichment teacher Becky Gast wrote, "My students and I loved our Skype session with Carrie! In a friendly and engaging manner, she spoke about how she created Panorama, answered students' questions, and asked questions of her own, making it a very interactive experience. We were thrilled to speak with a published author and to deepen our knowledge of mythology. We all ended the session with smiles on our faces!" Please contact Carrie (724.443.2968) if you are interested in scheduling an author visit, either in person or through Skype. On Friday, May 4, the Pitt-Greensburg Children's Literature Conference will feature Caldecott Medal-winning author/illustrator Eric Rohmann, as well as prolific author Candace Fleming, whose most recent book on Amelia Earhart was named a Hornbook Best Book of 2011. Carrie Kennedy is honored to have been asked to give a workshop during the Conference, and she will offer a multi-media presentation called "Marvelous Myths and Their Meaning." The Conference welcomes school and public librarians, K-12 teachers, and others interested and invested in the world of children's literature and learning. Carrie, an instructor at OSHER's adult education program at the University of Pittsburgh, is currently teaching a five-week course on the Oakland campus. She is helping her students explore the theory of multiple intelligence set forth by Harvard professor Howard Gardner, and is also discussing Dan Pink's A Whole New Mind and Drive, Ken Robinson's The Element, and Carol Dweck's Mindset. So far, the students have been extremely receptive to the material, and Carrie thoroughly enjoys teaching to this demographic. The best part? No grading! Carrie Kennedy is back on the campus of The University of Pittsburgh as an instructor for their OSHER Lifelong Learning Program. Her current course is titled "The Relevance of Classical Mythology and an Exploration of the Hero's Journey," and she is delighted to have 45 adults in the classroom each Wednesday. 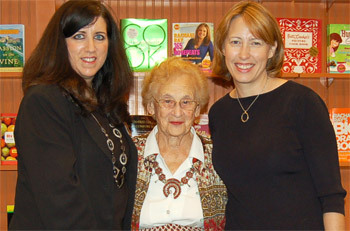 Carrie Kennedy was asked to join other area writers at Penguin Bookshop in Sewickley for an author signing event. Carrie is most excited to share the space with Meredith Mileti, a fellow Pittsburgher and Hamilton College graduate whose newly released novel—Aftertaste: A Novel in Five Courses—has received rave reviews. Stop by the store between 6:00 to 8:00 on Friday evening, December 9, to purchase some holiday gifts and meet great local authors. Rick Riordan event a Olympian-sized success! Carrie Kennedy was introduced to the standing room-only crowd in Oakland's gorgeous Carnegie Lecture Hall on Wednesday, October 5. After giving a short speech, she rallied the crowd to help her invite the guest to the stage, and got 650 people to yell, "Welcome to Pittsburgh Rick Riordan!" After Riordan's enjoyable talk about his love for mythology and the ups and downs of the writing life, Carrie moderated questions from a select panel of kids and then from the excited audience. There was a mad rush to signing line in the Carnegie Library, where Riordan autographed books for hundreds of readers. Kudos to the students at North Allegheny's Hosack Elementary School for helping Carrie to design the amazing sets that appeared on stage and behind Riordan's signing table, and to all the great audience members who asked questions! Carrie assisted at the fabulous Penguin Bookshops' table during the activities, happily signed copies of "Panorama," and was thrilled to be approached by enthusiastic new readers and familiar faces in the crowd. And Carrie's friend and colleague Zee Ann Poerio did an amazing job running her Ancient Coin Museum nearby. 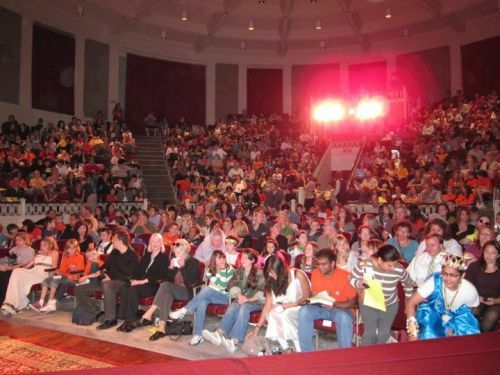 Here's a photo of the crowd just before the show. 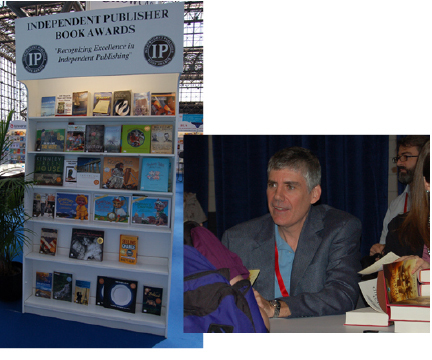 Over 150 bookstores and libraries throughout the United States and Canada submitted proposals, and Pittsburgh’s Penguin Bookshop was one of only seven chosen as stops on Rick Riordan’s The Son of Neptune book tour. Carrie and her husband Kevin were asked to work on the proposal, which was spearheaded by Penguin, the Carnegie Library of Pittsburgh, Pittsburgh’s Arts & Lectures, and several local school districts. 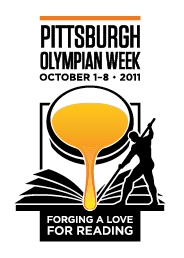 Penguin, located in Sewickley, will be organizing an Olympian Week from October 1-8, and Riordan will appear at the Carnegie Lecture Hall on the evening of Wednesday, October 5. Carrie will be appearing in several elementary and middle schools in early October to discuss mythology; she is thrilled to serve as the moderator for Riordan’s Q&A session at the Lecture Hall; and she will do her best to help the amazing staff of Penguin move hundreds of Percy Jackson fans through the line to have their books signed by the author! Read this article from USA Today to learn more about Disney/Hyperion book launch. Three more schools have recently adopted Panorama for use in their classrooms. Middle school students at the Flint Hill School in northern Virginia will be reading the book as part of their Latin curriculum; eighth grade students at Sewickley Academy in Pittsburgh, Pennsylvania, will spend several months on the book in their English classes; and high school students in the literary arts program at the Lincoln Park Performing Arts Charter School in Midland, Pennsylvania, will use the book as a basis for studying young adult fiction and the Hero’s Journey beginning this fall. This fall, Carrie will begin an adjunct teaching position at the acclaimed Lincoln Park Performing Arts Charter School in Midland, Pennsylvania. Teaching three classes a week and conducting additional assignments online, she will be part of the school’s Literary Arts Department and work closely with department chair and author Dan LeRoy. Using classical mythology as a base, Carrie will help high school students analyze plots, characters, and messages in modern young adult fiction, and understand the concept of Joseph Campbell’s Hero’s Journey, which is ever-present in both literature and film. Penguin Bookshop in Sewickley, Pennsylvania, asked Carrie to help get author Rick Riordan to put Pittsburgh on his list of stops to promote the October release of the next Percy Jackson book, The Son of Neptune. Publisher Disney/Hyperion will select only 7 cities for this limited tour, and Carrie worked closely with Penguin, Pittsburgh’s Arts & Lectures, Pittsburgh’s Carnegie Libraries, and teachers from several Pittsburgh-area school districts to put together a proposal of epic proportions. As if designing Panorama weren’t enough, Carrie’s husband Kevin stepped up to the plate once again to design a logo that showcases Pittsburgh’s connection with Hephaestus, the god of the forge. Plans are already in motion for Penguin to host a Mythology Crawl on October 1 in Sewickley, and if Rick Riordan does come to town, Carrie has been chosen to act as moderator in his Q&A session at the Carnegie Lecture Hall. Penguin will be notified in mid-August, so until then, Carrie (and her Percy-loving daughters) have their fingers crossed. Shortly after returning from the American Classical League’s Institute in Minneapolis, Carrie headed back west to Wichita, Kansas. There she worked with four other members of the National Mythology Exam Committee to review the 2012 exam and prepare for the 2013 version. She was delighted to finally meet Diana Nixon, a fascinating teacher from Wichita’s Collegiate School who had been one of Panorama’s earliest reviewers, and Diana’s talented colleague Allison Fiegel, who currently chairs the committee. She also had the pleasure of working with Kris Tracy, the 2011 recipient of a Merita Award for distinguished service to the classics, and Laurie Darman, a dedicated teacher who was instrumental in developing the National Mythology Exam 22 years ago. Anyone interested in learning more about the National Myth Exam can click here. Latin teachers and classics enthusiasts from across the country met in Minneapolis from June 24-27 for the annual ACL Institute, and Carrie was pleased to attend as a representative for the National Mythology Exam Committee. She answered questions from teachers interested in administering the Exam, attended numerous workshops, and renewed friendships with people she had met when she went to her first ACL Institute in Los Angeles two years ago. Highlights included the chance to finally meet Penny Cipolone, a veteran Latin teacher who had reviewed Panorama in its early phases, and being approached by teachers who have had success using Panorama in their classrooms. Omnia sunt bona. Carrie taught a mythology course through the University of Pittsburgh’s Osher Lifelong Learning Institute last spring, and she has been asked back again this year. She is currently finishing up a second mythology course—this time focusing on the connections between mythology and modern literature—and will begin a five-week course on multiple intelligences in April. Please use this link for more information about the Osher program. Carrie has been invited to speak on the subject of self-publishing at the annual Pennwriters Conference, scheduled to be held in Pittsburgh on May 13-15. Registration for the conference begins March 1, and more information can be found here. On February 2-5, The Association of Writers and Writing Programs held its Annual Conference and Bookfair at Washington, D.C.’s Marriot Wardman Park Hotel. The AWP’s meeting is designed to celebrate the country’s outstanding authors, teachers, writing programs, literary centers, and small presses, and Carrie and Kevin were excited to be among the nearly 8,000 attendees. Featured at this year’s Conference were dozens of award-winning poets, writers, and musicians, including Rita Dove, Joyce Carol Oates, Sapphire, and Mary Gaitskill. Carrie and Kevin divided their time between attending panel discussions and manning their table to promote Panorama, and they truly enjoyed meeting so many interesting and interested people in an exhibit hall filled with 500 publishers, agents, university presses, and writer’s programs. Their most rewarding experience at the AWP was getting Panorama into the hands of such a wide variety of people: poets and writers who wanted the book as an inspirational resource; a man who planned to use the book in his program for Alzheimer patients; adults who wanted to give the book as gifts to their children or grandchildren; a design professor who intends to present the book as an example of outstanding self-publishing; and numerous teachers and professors who want to adopt the book for their courses. Carrie will be appearing at Penguins Bookshop in Sewickley, PA, on Saturday, December 4 as part of the store’s annual holiday Beckoning of Booklovers event. She will be meeting customers and signing books from 11:00 until 11:45, and then at noon, she will take part in a panel discussion with a dozen other authors. A reception and book signings will continue until 1:00 that afternoon. Click here to learn more. Please stop by! Carrie will be the speaker for a Lunch and Learn program on Thursday, November 18 at the beautifully remodeled Penguins Bookshop in Sewickley, PA. The program, which begins at 11:30, features a catered lunch from Sewickley’s Little Athens Restaurant followed by Carrie’s interactive presentation on mythology’s influence on literature, science, popular culture, and the visual arts. Please contact Penguins to register. Have you been reading Rick Riordan's newest adventure, The Lost Olympian? If you have enjoyed it or any of Riordan's other works about the quests and quandaries of the demigods who walk amongst us, join Carrie Kennedy at the Penguin Bookshop on Thursday, November 18, for an engaging discussion. Rumor has it that blue food—all of Percy's favorites—will be available. The program begins at 4:15, and we would love to see you there. Click here to learn more. The Lincoln Park Performing Arts Charter School has invited Carrie Kennedy to be an artist-in-residence in their Literary Arts Department this fall. Carrie has enjoyed working with author Dan LeRoy, the program’s director, to plan the program, and she will present a two-week study on classical mythology’s influence on modern literature, music, and film. Students will discuss Joseph Campbell’s concept of the Hero’s Journey and read poems, lyrics, and short stories that are rooted in the ancient stories. Carrie is excited to return to the classroom, this time to help high school students recognize the continued relevance of mythology and to deepen their culturally literacy. On Thursday, September 9, Carrie Kennedy will present “Don’t Miss the Myths” as part of Pittsburgh’s Carnegie Museum of Art’s Lunch and Learn Series. Following Carrie’s presentation at 10:30 in the Museum’s Theater, the group will enjoy lunch at the Museum of Art Café and then be taken on a tour by Carrie and two docents through the stunning Hall of Architecture and the gallery’s collections to see mythology represented in art. Please call 412.622.3288 to register, or visit the Carnegie Museum site for more information. Carrie and her husband, Kevin, were thrilled to learn their book was chosen as a medalist in this year’s IPPY Awards, the largest indie press awards in the country. Nearly 4,000 books were submitted by university presses, small presses, and independent publishers, and only 8% received recognition. Books were evaluated on the quality of their content and design, their cultural relevance, and their overall message, and Panorama was among the top six books chosen in the competitive category of Juvenile/Young Adult Non-Fiction. Other imprints that received recognition included Yale University Press, The Metropolitan Museum of Art, University of Chicago Press, Harvard University Press, Abbeville Books, and Syracuse University. Carrie attended the awards ceremony at the Providence Club in New York City on Tuesday, May 25, and had a chance to meet authors, illustrators, and photographers, as well as Jerry Jenkins, CEO of the Jenkins Group and the founder of the awards program. She received a certificate and medal (which her two young daughters now clamor to wear), along with awards labels that she can place on the cover of Panorama to announce the win. 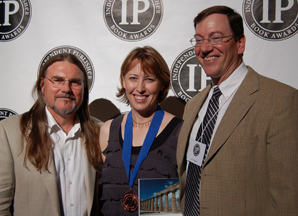 Carrie poses here with Jerry (right) and Jim Barnes, the Awards Director. Carrie is pleased to have been invited to speak at numerous area libraries and bookstores this summer. The Carnegie Libraries have a theme of "Make a Splash" for their Summer Reading Programs, and Carrie will be will be telling stories from mythology that are related to water, and—for older tweens and teens—will be incorporating elements from Rick Riordan’s series of books about Percy Jackson (who just so happens to be the half-blood son of the sea god Poseidon). July 10, 12 pm – 3 pm at the Joseph-Beth Booksellers in the Southside Works for a family-friendly Mythology Day Event. Free and open to the public. July 14, 7 pm – 8 pm at Penguin Bookshop in Sewickley, speaking on Joseph Campbell’s concept of the Hero’s Journey and how it relates to mythology, movies, Percy Jackson, and so many of our most popular stories. There is a $5 fee for this workshop, so please register with Penguin in advance. July 19, 11:30 am—1:00 pm at the Sewickley Library for their lunch programs, for students entering grade K through 2. Free to the public; please register through the library. July 22, 11:30 am—1:00 pm at the Sewickley Library for their lunch programs, for students entering grade 3 through 5. Free to the public; please register through the library. July 24, 1:30 pm — 3:00 pm at the South Park Township Library for students entering grades 4 and older. Free to the public; please register through the library. August 4, 1 pm – 2 pm at Penguin Bookshop in Sewickley, speaking on Egyptian mythology with references to Rick Riordan’s newest series, The Kane Chronicles. Please check back soon for a link that will offer more information. For Pittsburgh-area librarians who would like Carrie to offer a program, please visit the Allegheny County Library Association's program page. While Carrie was in New York to receive an IPPY Award for her book, she also spent two days at Book Expo America, the largest book show of the year. In an atmosphere not unlike Times Square on New Year’s Eve, she met fellow self-publishers, learned about marketing strategies, perused soon-to-be-released books, and browsed through the exhibitis of every major publisher in the country. She was proud to see Panorama on display at the Combined Book Exhibit for independently published new releases (in the photo, the book is in the center on the third shelf down) and was able to promote her book to teachers, librarians, and independent bookstore owners. She also happily waited in line for an hour and a half to meet Rick Riordan (pictured below), author of the mythology-based Percy Jackson series of books published by Hyperion. He autographed a copy of his latest work, The Red Pyramid, and then accepted a copy of Panorama as a gift. Riordan’s work has successfully engaged countless young students with its witty heroes and well-told stories, and Carrie was truly honored to be able to put her book into his hands. In the fall of 2009, Carrie had the pleasure of meeting and interviewing Dan Pink, author of two New York Times bestselling books, Drive: The Surprising Truth About What Motivates Us and A Whole New Mind: Why Right-Brainers Will Rule the Future. She then wrote an article for Independent School’s themed issue on the importance of encouraging generative thinking. I am sitting at a small table in the basement coffee shop of Politics and Prose Bookstore in Washington, D.C., having a conversation with the best-selling author, and I had just asked him what motivated him to write his four books. The Osher Lifelong Learning Institute offers continuing education opportunities for those aged 55 and older at over 120 American colleges and universities. On Wednesday, March 17, Carrie began teaching a five-week course on mythology on the University of Pittsburgh’s campus. Her course, titled “The Truth About Myths: Recognizing the Relevance of Classical Mythology,” revealed how the timeless myths still impact science, vocabulary, art, literature, movies, and popular culture. "Carrie is an exceptional instructor. Her educational background and training shone through in this course. She was knowledgeable and organized, she communicated clearly, and she demonstrated both humor and respect." "Carrie was a joy to have as an instructor, and I'd take another course from her in a heartbeat." Panorama was recently selected for a juried design show sponsored by the Pittsburgh chapter of the American Institute of Graphic Arts (AIGA). Hundreds of communications pieces were submitted, and Panorama was one of only a handful of books accepted. A reception was held at Pittsburgh’s SPACE Gallery on March 11, and Carrie was thrilled to attend with her husband, Kevin Kennedy, the book’s designer. Kevin is Vice President and Creative Director of Mizrahi, a marketing communications firm in Pittsburgh. The AIGA show, titled Context, is open to the public through March 21. Carrie has begun working with the team at Pittsburgh’s Carnegie Science Center’s Buhl Digital Dome to develop a program, “Astronomy and Mythology: The Stories in the Stars.” The program, which features Carrie talking about classical deities and retelling myths while planets and constellations are projected onto the dome, will be debuted as part of the Science Center’s Astronomy Weekend on March 27 and 28. Carrie is scheduled to speak at 3:00 on Saturday, March 27 and will also be signing copies of Panorama before and after her program. Children in grades 4 through 8, along with their interested parents, packed a room to hear Carrie Kennedy speak at Pittsburgh’s Greentree Library on Tuesday, March 9. Her presentation, “Everyday Mythology,” revealed just how relevant mythology is in modern times: from cereal to Nike shoes to hit song lyrics, the subject remains a key component of our cultural literacy. Carrie also drew connections to the Percy Jackson series of books and the recent release of the first movie, The Lightning Thief, helping her audience better understand the mythological references in the works. During the first few months of 2010, Carrie Kennedy has been invited to speak in classrooms and at homeschooling and Montessori events about the subject of classical mythology, as well as the timely topic of the Olympic Games. Events could actually have been held in her own backyard because of the record-setting snowfalls in Pittsburgh for the month of February! Carrie also completed two articles that will be published within the next few weeks. The first, a piece on the importance of generative thinking, will be the online feature for the spring issue of Independent School, the award-winning magazine published by the National Association of Independent Schools. The article centers on Carrie’s personal interview with New York Times bestselling author Dan Pink and his new book, Drive: The Surprising Truth About What Motivates Us. Carrie’s second article will be a feature in Hamilton College’s Winter 2010 alumni magazine. For this piece, Carrie wrote about her experience of choosing to leave a traditional workplace to be at home with her children, and she enjoyed interviewing several other alums that made this same choice. On Saturday, December 5, Carrie will appear at the Heinz History Center, an affiliate of the Smithsonian Institution, for their annual History Center Book Fair. The event is free and open to the public, and runs between 10:00 and 2:00. On Monday, December 7, Carrie will be one of three authors at Pittsburgh’s Joseph-Beth Booksellers’ “Home for the Holidays Local Author Night.” Please stop in to see her, along with novelist Lianne Norman and children’s author Dave Crawley, between 7:00 and 8:00 in Pittsburgh’s South Side Works. Learn more at Joseph-Beth Booksellers. Carrie enjoyed a successful signing event at Sewickley’s Penguins Bookstore in November, and has been invited back for another event on Saturday, December 12, from 11:00 to 1:00. Carrie Zuberbuhler Kennedy wants people to know that Greek mythology doesn't have to be "all Greek" to them. In her new book, "Panorama: An Introduction to Classical Mythology," readers can find out how some of the stories have carried over to current society. The 1986 graduate of Sewickley Academy and former academy eighth-grade English teacher last week was among five local authors signing books at Penguin Bookshop. Carrie Kennedy thinks about classical mythology all the time, even at the breakfast table. The word cereal, she explains, is derived from the name Ceres, the Roman goddess of the harvest. As an eighth-grade English teacher at Sewickley Academy, Kennedy tried to relay her passion for myths to her students, but she felt the standard textbooks were dry and overly complicated. Instead of embracing the epic stories of Homer and Virgil, the kids got bogged down in boring details and tongue-twisting names. Carrie traveled to the Kiski School in Saltsburg, PA, the location of the annual conference for the Pennsylvania Area Independent School Teachers' Association. Her workshop, titled “More than Story: The Limitless Possibilities of a Well-Designed Mythology Course,” was filled to capacity and drew teachers from all disciplines. Carrie discussed the current works of both Howard Gardner and Daniel Pink and lead a discussion on how subjects such as mythology can encourage students to become more creative thinkers and more compassionate learners. After the talk, Carrie headed over to the vendor’s hall, where she was delighted to meet and greet teachers and administrators and sell copies of Panorama and its teachers’ guide. For more information about PAISTA, please visit www.paista.org. Carrie Kennedy traveled to Wilmington, DE, to attend the 2009 Annual Meeting of the Classical Association of the Atlantic States. Carrie felt fortunate to meet so many interesting teachers and to have the opportunity to dine next to Mary Brown, current Executive Director of CAAS. Click here to visit CAAS' website. The Book Fest, attended by nearly 40 authors, ended up being a perfect venue for Carrie’s first official book signing. She and her husband, Kevin, had a successful day and enjoyed meeting and sharing ideas with other writers and publishers. Kudos to Book Fest co-ordinators Cassie and Val Brkich, who did an outstanding job organizing and promoting the event. After meeting classicist, author, and costume expert Norma Goldman at the ACL Institute in June, Carrie was thrilled to have the chance to see her again when Norma came to Pittsburgh as part of an ETC 20th anniversary event. And this time, Carrie was lucky enough to be wrapped up in an original Goldman creation as part of a Roman fashion show, held in the Carnegie Museum's stunning Hall of Architecture. Carrie, along with Minimus Latin series author Barbara Bell and a dozen other models, were the envy of all the museum patrons who saw the show. The day after the Carnegie event, Carrie gave a presentation at one of Pittsburgh's Barnes & Noble bookstores to a gathering of great teachers. Her talk focused on Howard Gardner's multiple intelligence theories and how well they can be incorporated into the study of classical mythology. Carrie also spoke about Panorama and received enthusiastic comments on her book. The photo below shows Norma Goldman, center, with Carrie and Pittsburgh-based teacher Zee Ann Poerio, who did an outstanding job organizing the events to celebrate ETC's anniversary. Click here to learn more about ETC and its National Mythology Exam. In June, Carrie attended the ACL’s Institute, where she shared preview copies of Panorama and made a presentation on the ease of teaching mythology through differentiated instruction. She enjoyed the experience and was thrilled with the warm reception she received from so many passionate and dedicated teachers. 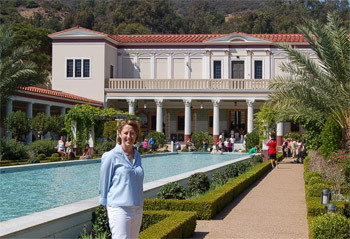 In the photo below, Carrie is standing in front of the gorgeous Getty Villa, where many of the Institute’s attendees spent a Saturday afternoon. Visit the American Classical League’s website at www.aclclassics.org. An article on page 4 of the Excellence Through Classics Spring ‘09 newsletter describes how Carrie was inspired by Joseph Campbell’s comment that it’s “the teacher’s job to help you find your Ariadne thread.” And the piece goes on to describe that her book, Panorama, was a chance to weave together her love of stories, her passion for clear writing, and her appreciation of individual learning styles. Download a PDF of the newsletter here. Carrie would like to thank ETC Chair Micheal Posey for all the effort he put into PRIMA, and she really enjoyed meeting him in Los Angeles. 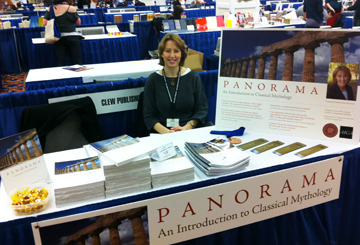 Carrie debuted her mythology book to the classics community at the PCA event in eastern Pennsylvania. After an outstanding presentation by renowned classics professor Terence Tunberg of the University of Kentucky, Carrie gave a talk on various approaches to teaching mythology, and she enjoyed getting to know classics teachers from her home state. Click here to visit the Pennsylvania Classical Association’s website.